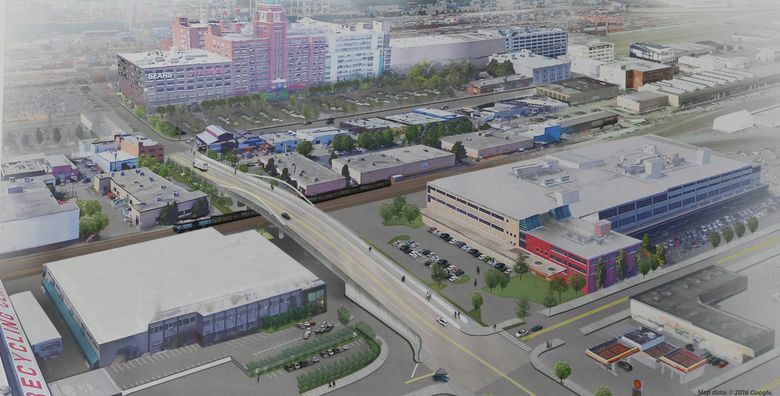 While the plan for a Sodo District arena envisioned by entrepreneur Chris Hansen wasn’t helped by the Port of Seattle spending an extra $10 million to complete funding for the Lander Street overpass, it’s far too early to pronounce anything dead. Proponents of an arena proposal in Seattle’s Sodo District spent much of last week prematurely sounding the project’s death knell. While the Sodo plan envisioned by entrepreneur Chris Hansen wasn’t helped by the Port of Seattle spending an extra $10 million to complete funding for the long-awaited Lander Street overpass, it’s far too early to pronounce anything dead. Sure, Hansen also proposed to bridge that Lander funding gap, so long as the Seattle City Council sold him part of Occidental Avenue South to complete his arena land acquisitions. But consider how that same city council already voted down one such Occidental request by Hansen in May 2016. Now, the council is preparing to review, beginning Sept. 12, a draft Memorandum of Understanding (MOU) between the city and the Los Angeles-based Oak View Group (OVG) to renovate KeyArena for $564 million. In other words, the reasons to approve Hansen’s latest Occidental request — at least this year — are vanishing. That has caused consternation among fans supporting the Sodo project. But when you review what has happened the past few years, last week’s events are no surprise. And when you look at the Hansen group’s long-term stated goals — an arena catering primarily to the NBA — last week’s events didn’t really change anything. First, no one should be shocked the Port spent big money to improve Sodo traffic while blocking a Hansen offer. Or that the council went along with it. Hansen supporters have tried to portray opposition to the Sodo arena as a vast conspiracy by the Port and “old-money” Seattle allies. As evidence, they say the Port claimed without substantiation that losing Occidental would irreparably harm freight traffic. They note the Port-funded Lander overpass could still seal off Occidental in two locations and provide the same type of traffic chokehold. Problem is, the Sodo opposition argument has never been about one or two blocks of Occidental alone. That was merely the reframed message put out by Sodo backers, which ignored the larger argument that a Hansen arena and retail development on multiple streets surrounding it would impact the entire neighborhood. It was a concern Port officials and supporting Maritime unions and sports teams tried to repeatedly convey before the May 2016 vote, albeit clumsily. But the public messaging by Sodo-arena supporters — some taking to rooftops to videotape an empty Occidental at all hours — often trumped the Port’s lobbyists and PR types. The Sodo side repeatedly pushed the message that the opposition was about only one or two blocks of a back alley. But it was a false message. The point was reinforced in March when the Mariners, Seahawks, Sounders and Sodo trade-show groups wrote the city demanding Hansen be made to sign a binding event-scheduling deal. They again argued this was about traffic congestion and parking in the entire Sodo neighborhood — not just on Occidental. And the city listened. In fact, the department of transportation said the need for a scheduling deal was one of several key issues it was reviewing before recommending whether to grant Hansen’s latest Occidental request. To date, no such deal is being negotiated. With the KeyArena draft MOU pending, the transportation department is putting its Sodo review on hold. So the council likely won’t look at Sodo again before reviewing KeyArena plans and perhaps approving them in a vote. But is that really a big deal? Not when you consider facts. First, the council already rejected Hansen once on Occidental, citing multiple concerns yet to be addressed. Among them: Hansen’s lack of teams and significant Sodo stakeholder opposition to increased congestion in the entire neighborhood. Also, Hansen has yet to unveil his full investment group, or completely detail his all-private financing plan. Right now, the city and OVG are negotiating to build an upgraded music facility at KeyArena that could land an NHL franchise by next year. Much has been made about Hansen’s five-year-old MOU with the city and King County expiring Dec. 3. But that’s just a mechanism to give him public money if he lands an NBA team by then. Hansen likely isn’t getting the NBA by December. So, his MOU already is as good as dead. And Hansen doesn’t need it to keep pitching his all-private plan. If Hansen wants to build a concert venue or lure the NHL here, that competition is underway. OVG is offering an all-private “on spec” build at KeyArena and detailing its full investor group, financing and future NHL ownership group. But Hansen hasn’t done that, which is why there appears no hurry to grant his latest Occidental request. Just don’t mistake that as killing a Sodo arena for good. If Hansen’s true goal is primarily an NBA arena, he can still fight that fight once the NBA is actually in play. Right now, on imminent things such as music and the NHL, only OVG has answered the bell. And it isn’t the city’s job to drag the Sodo group into a competition it doesn’t appear that interested in. But when that battle for an NBA team truly heats up in another year (or two, or six), last week’s developments won’t impede Hansen from jumping into the fray — either with the same request for Occidental, or a different strategy that might yield a better result.